Early during December 2017 I received a telephone call that a stray ferret was at my local vets, I gathered a home was needed so I went to collect him after work. When I arrived there were two young albino hob ferrets in adjacent cages, one had my name on it. I thought it would be unfair to leave one without the other. Both had been found in the same area, both seemed to know the other when put together. Both are tame,initially they were a bit thin, but have bulked up with ample food. 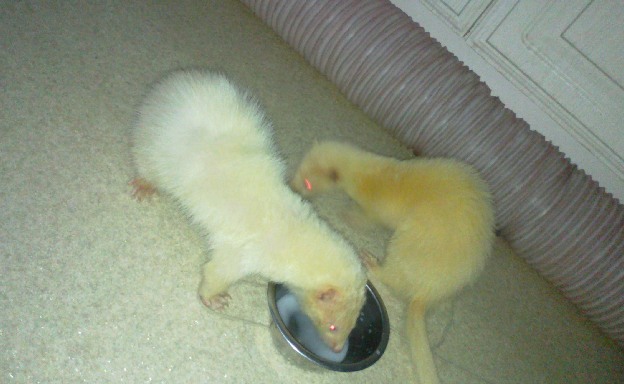 Jack, the smaller one, seems to want to nip slippers or socks, but not in a spiteful manner, Sam, the larger more dominant ferret is very laid back. Lovely creatures both. During February I deemed necessary to have the pair neutered. I elected to have implants (suprelorin), rather than castration, having read an article on the subject.